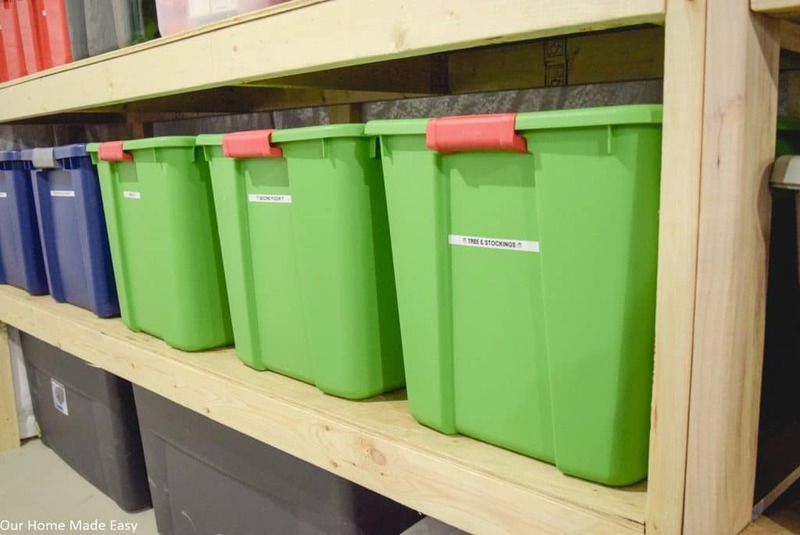 When it comes to organizing, I have a small addiction to storing everything in plastic totes. While they aren’t all the same color or size, I love the feeling of packing away we don’t need right now in exchange for freeing up some space around the house. However, the totes need some organization themselves! 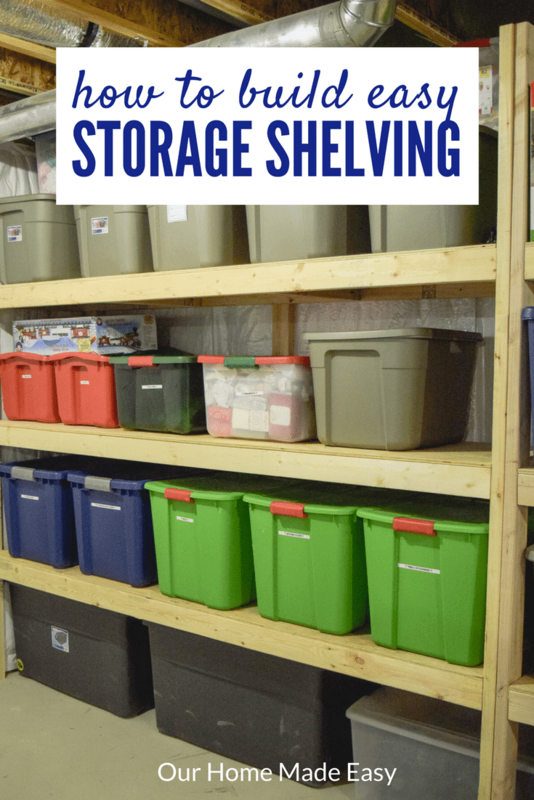 And that led us to this super easy DIY storage shelving that Jordan built for less than $70! You might remember from how we organize our kid’s clothing, I use totes to keep them sorted by size and season. But clothes aren’t the only things we keep in our totes. 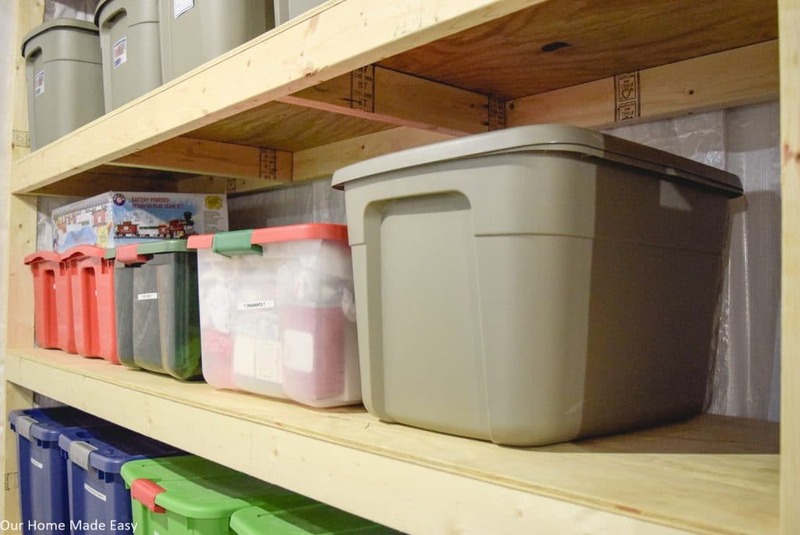 These storage shelving units are easy to build and setup next to one another to hold all of your totes! While picking up your lumber at Home Depot, have a team member cut your plywood in half long ways, so you have 4 ea 96” x 24”. Get your supplies home and get ready to organize. Take 4 of your 2”x4” and cut them on your miter saw to end up with 12 ea 21” pieces. After this, put two kreg pocket holes in each end of the 12 21” pieces. 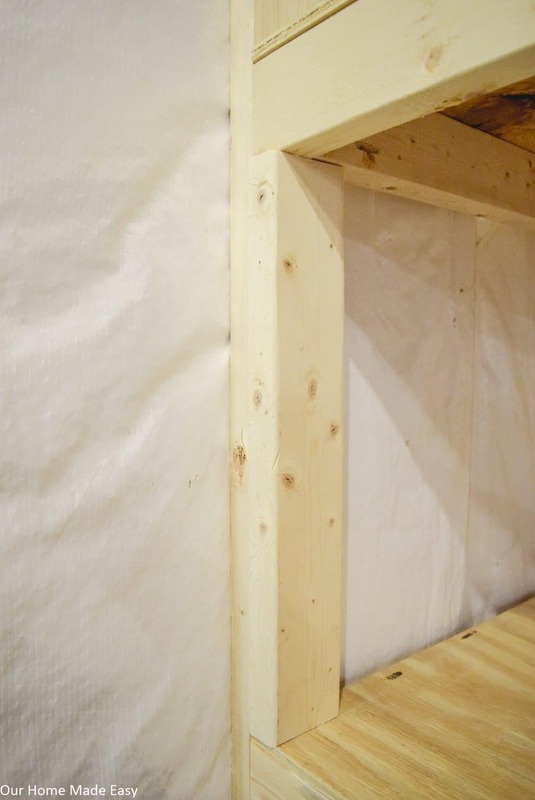 To build your three shelves, stand two of your 8’ long 2”x4” and four of your 21” pieces on their side. Place two 21” pieces on both ends and two more 32” from each end. 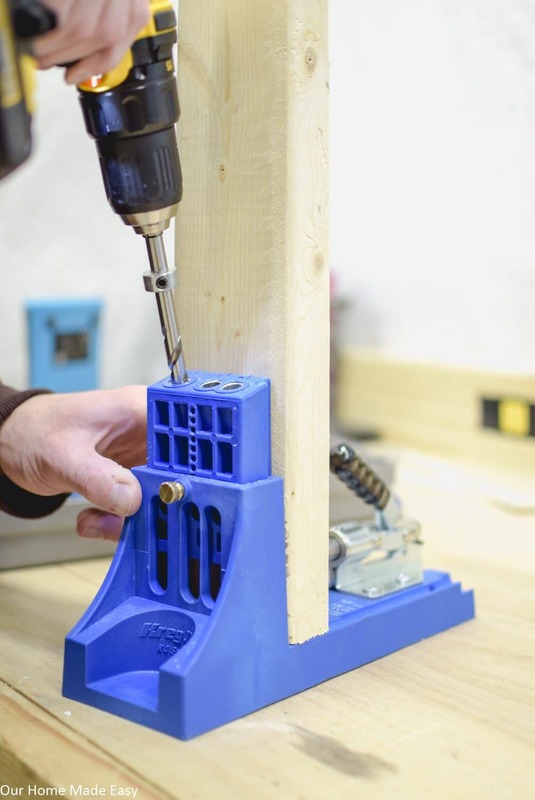 Attach the 21” pieces to the 8’ boards with 2.5” kreg screws. Mark the front of your 8’ boards with a pencil where the supports are. 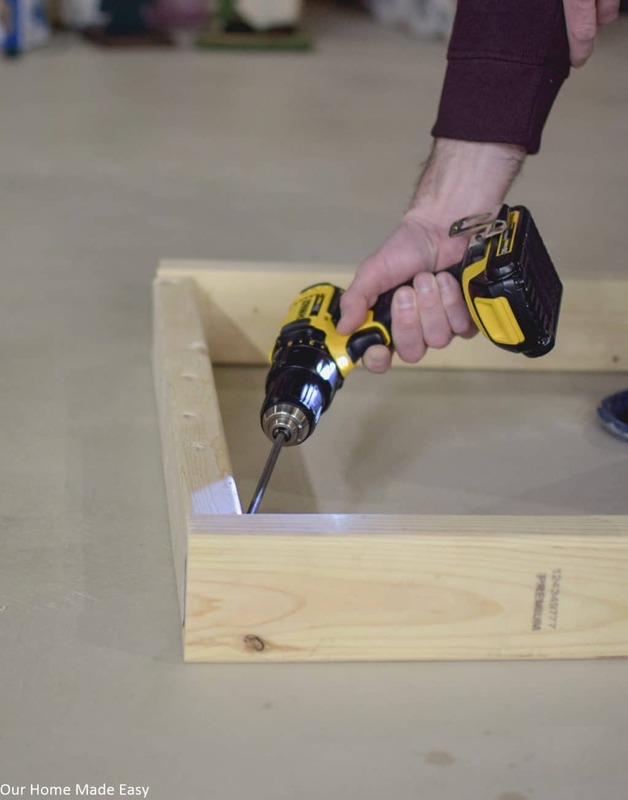 This will help you when nailing the plywood to the top. Apply some wood glue to all of the tops of the 2”x4” pieces. 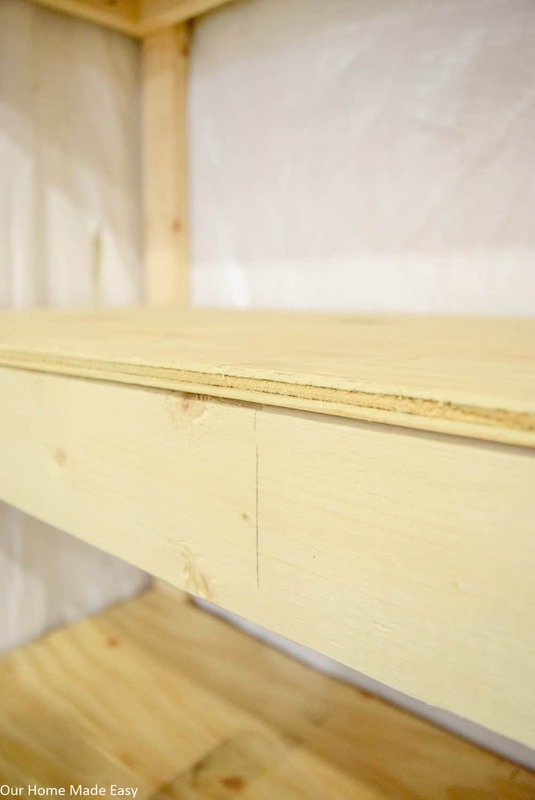 Place the plywood on top of the shelf supports. 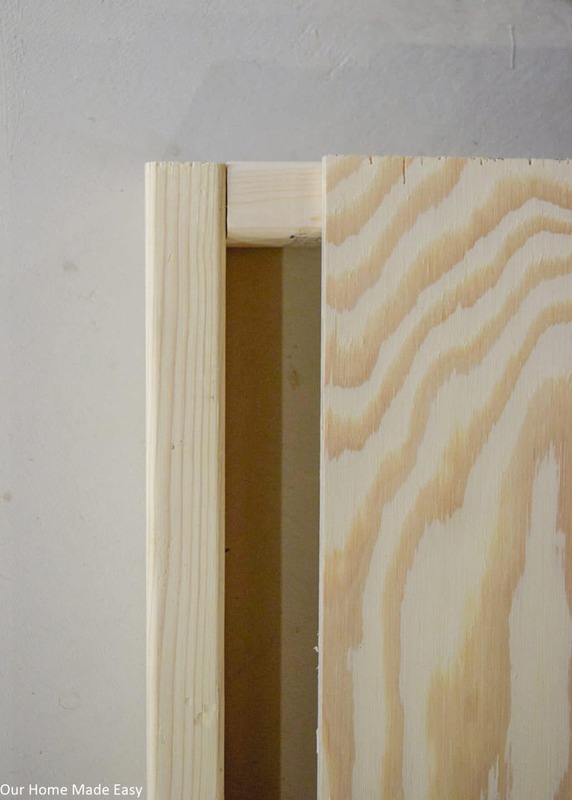 For the next part, I used my air nailer, but if you don’t have one, you can use a few general purpose nails to attach the plywood to the supports. Repeat 2 more times. After your shelves are made, its time to add your legs. We determined which totes/items we wanted on the floor. Then I placed a few 2”x4”s on their side on top of the totes. This was to allow for spacing to pull the totes in and out. Place your first shelf on top of the 2”x4”s. 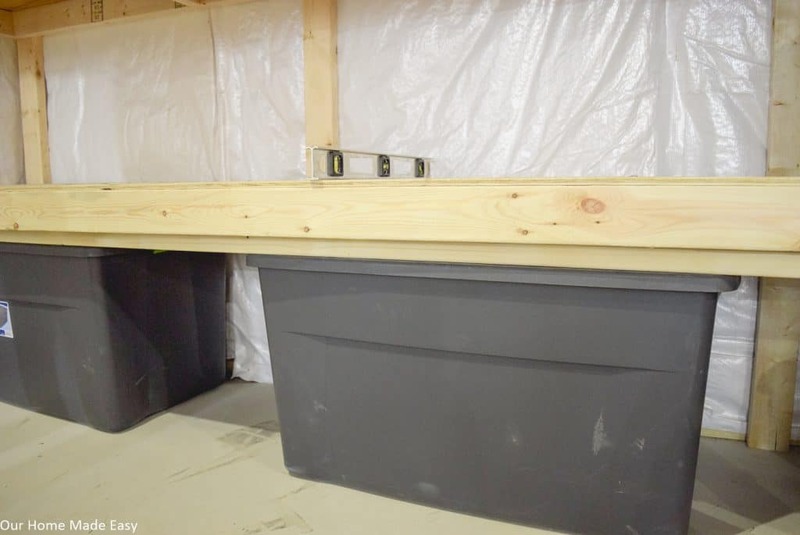 Then, take your legs and clamp them in place; this will allow you to ensure that the legs are all touching the floor, plumb, and flush with the shelves and the shelves are level. Once the fit is correct, attach the legs with 4-5 wood screws like these. For the last 2 shelves, ensure your tallest totes would clear the next shelf. Once I determined the proper height, I made some jigs to hold up the shelf while I ensured the shelf and legs remained plumb and level during fastening. While we started off with just one shelving unit, Jordan quickly needed to make another! 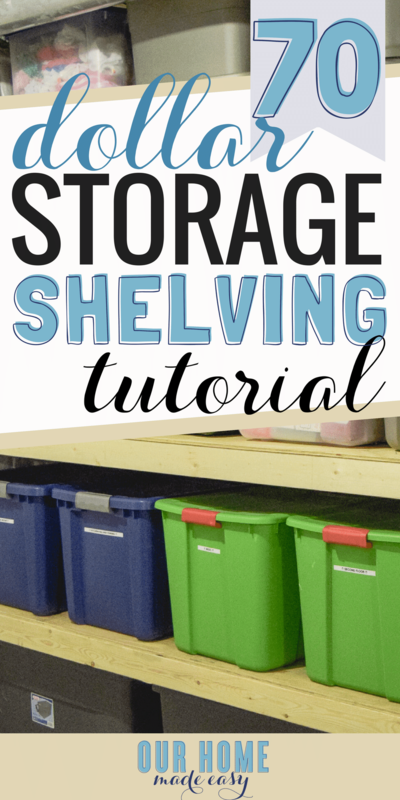 Storage shelving doesn’t need to be too complicated! You can make one with just a few pieces of lumber and the Kreg Jig. 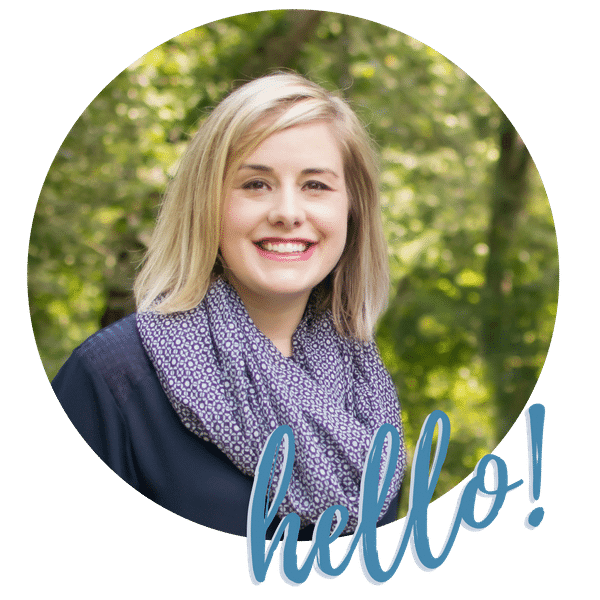 Happy Organizing! 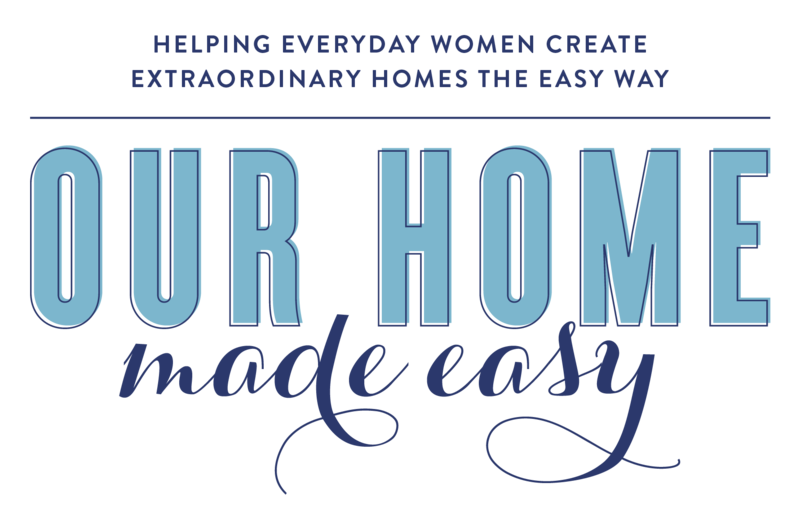 Get Your Guide for Our 5 Tools That Make DIY Projects Easier! I need to make some storage shelves like these. I built a work bench along the same lines as how you did this, but I used simpson strong ties to hold the 2x4s together in the corners. I can see doing that here too, but at $5 a piece if you have several shelves it would start adding up. I don’t think you can beat the cost/value of this design. This is very useful since my husband is quite handy and there’s a lot of DIY project I wanted to do and this shelving is one of them. 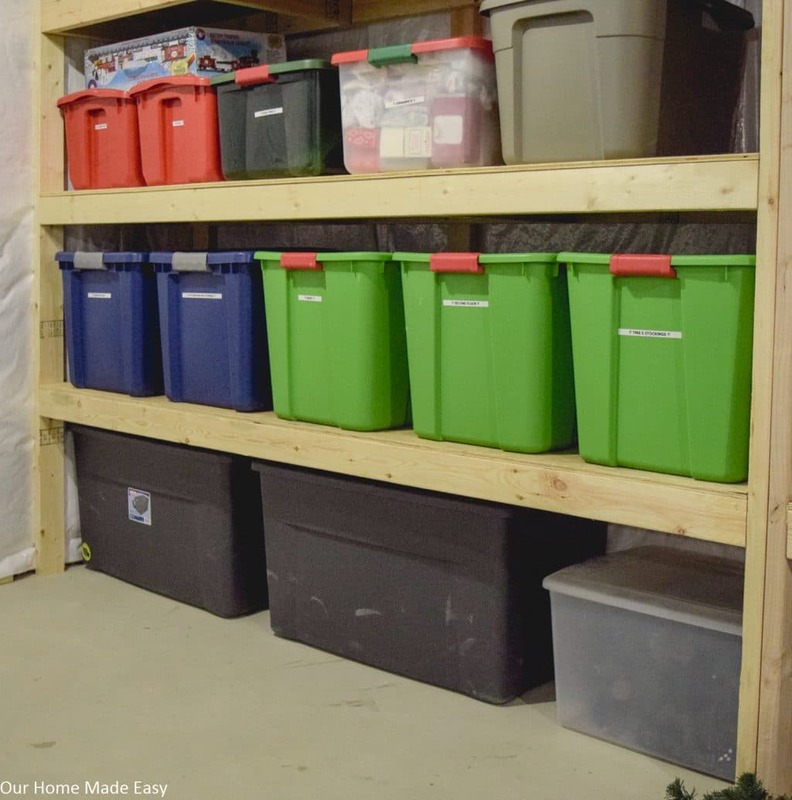 This would be great project for garage to organizing everything. Thanks Vilma! It’s awesome for storing just about everything 🙂 Thanks for stopping by!